37 C.F.R. 1.104 Nature of examination. (1) On taking up an application for examination or a patent in a reexamination proceeding, the examiner shall make a thorough study thereof and shall make a thorough investigation of the available prior art relating to the subject matter of the claimed invention. The examination shall be complete with respect both to compliance of the application or patent under reexamination with the applicable statutes and rules and to the patentability of the invention as claimed, as well as with respect to matters of form, unless otherwise indicated. (2) The applicant, or in the case of a reexamination proceeding, both the patent owner and the requester, will be notified of the examiner’s action. The reasons for any adverse action or any objection or requirement will be stated in an Office action and such information or references will be given as may be useful in aiding the applicant, or in the case of a reexamination proceeding the patent owner, to judge the propriety of continuing the prosecution. (b) Completeness of examiner’s action. The examiner’s action will be complete as to all matters, except that in appropriate circumstances, such as misjoinder of invention, fundamental defects in the application, and the like, the action of the examiner may be limited to such matters before further action is made. However, matters of form need not be raised by the examiner until a claim is found allowable. (1) If the invention is not considered patentable, or not considered patentable as claimed, the claims, or those considered unpatentable will be rejected. (2) In rejecting claims for want of novelty or for obviousness, the examiner must cite the best references at his or her command. When a reference is complex or shows or describes inventions other than that claimed by the applicant, the particular part relied on must be designated as nearly as practicable. The pertinence of each reference, if not apparent, must be clearly explained and each rejected claim specified. (3) In rejecting claims the examiner may rely upon admissions by the applicant, or the patent owner in a reexamination proceeding, as to any matter affecting patentability and, insofar as rejections in applications are concerned, may also rely upon facts within his or her knowledge pursuant to paragraph (d)(2) of this section. (i) Subject matter which would otherwise qualify as prior art under 35 U.S.C. 102(a)(2) and a claimed invention will be treated as commonly owned for purposes of 35 U.S.C. 102(b)(2)(C) if the applicant or patent owner provides a statement to the effect that the subject matter and the claimed invention, not later than the effective filing date of the claimed invention, were owned by the same person or subject to an obligation of assignment to the same person. (B) The application for patent for the claimed invention discloses or is amended to disclose the names of the parties to the joint research agreement. (i) Subject matter which qualifies as prior art under 35 U.S.C. 102(e), (f), or (g) in effect prior to March 16, 2013, and a claimed invention in an application filed on or after November 29, 1999, or any patent issuing thereon, in an application filed before November 29, 1999, but pending on December 10, 2004, or any patent issuing thereon, or in any patent granted on or after December 10, 2004, will be treated as commonly owned for purposes of 35 U.S.C. 103(c) in effect prior to March 16, 2013, if the applicant or patent owner provides a statement to the effect that the subject matter and the claimed invention, at the time the claimed invention was made, were owned by the same person or subject to an obligation of assignment to the same person. (6) Patents issued prior to December 10, 2004, from applications filed prior to November 29, 1999, are subject to 35 U.S.C. 103(c) in effect on November 28, 1999. (1) If domestic patents are cited by the examiner, their numbers and dates, and the names of the patentees will be stated. If domestic patent application publications are cited by the examiner, their publication number, publication date, and the names of the applicants will be stated. If foreign published applications or patents are cited, their nationality or country, numbers and dates, and the names of the patentees will be stated, and such other data will be furnished as may be necessary to enable the applicant, or in the case of a reexamination proceeding, the patent owner, to identify the published applications or patents cited. In citing foreign published applications or patents, in case only a part of the document is involved, the particular pages and sheets containing the parts relied upon will be identified. If printed publications are cited, the author (if any), title, date, pages or plates, and place of publication, or place where a copy can be found, will be given. (2) When a rejection in an application is based on facts within the personal knowledge of an employee of the Office, the data shall be as specific as possible, and the reference must be supported, when called for by the applicant, by the affidavit of such employee, and such affidavit shall be subject to contradiction or explanation by the affidavits of the applicant and other persons. (e) Reasons for allowance. If the examiner believes that the record of the prosecution as a whole does not make clear his or her reasons for allowing a claim or claims, the examiner may set forth such reasoning. The reasons shall be incorporated into an Office action rejecting other claims of the application or patent under reexamination or be the subject of a separate communication to the applicant or patent owner. The applicant or patent owner may file a statement commenting on the reasons for allowance within such time as may be specified by the examiner. Failure by the examiner to respond to any statement commenting on reasons for allowance does not give rise to any implication. For Office actions in ex parte reexamination proceedings, see MPEP §§ 2260, 2262, 2271 and their indents. For Office actions in inter partes reexamination proceedings, see MPEP §§ 2660, 2671, 2673, and their indents. Under the current first action procedure, the examiner signifies on the Office Action Summary Form PTOL-326 certain information including the period set for reply, any attachments, and a "Summary of Action," which is the position taken on all the claims. The examiner, in the exercise of his or her professional judgment, is permitted to indicate that an interview with applicant’s representative may result in agreements whereby the application may be placed in condition for allowance. Any amendment agreed upon during an interview may be made either by the applicant’s attorney or agent or by the examiner in an examiner’s amendment. It should be recognized that when extensive amendments are necessary it would be preferable if they were filed by the attorney or agent of record, thereby reducing the professional and clerical workload on the Office and also providing the file wrapper with a better record, including applicant’s arguments for allowability as required by 37 CFR 1.111. See MPEP § 713 et seq. for interview practice. The list of references cited appears on a separate form, Notice of References Cited, PTO-892 (copy in MPEP § 707.05) attached to applicant’s copy of the Office action. Where applicable, a Notice of Informal Patent Application is attached to the first Office action. The attachments have the same paper number and are to be considered as part of the Office action. Replies to Office actions should include the application number as well as the 4-digit art unit number and the examiner’s name to expedite handling within the Office. Further, applicants are encouraged to include the 4-digit confirmation number on every paper filed in the Office. See MPEP § 503 for an explanation of the confirmation number. In accordance with the patent statute, "Whenever, on examination, any claim for a patent is rejected, or any objection... made," notification of the reasons for rejection and/or objection together with such information and references as may be useful in judging the propriety of continuing the prosecution (35 U.S.C. 132 ) should be given. Information useful in judging the propriety of continuing the prosecution may include, for example, the identification and a brief discussion of the particular figure(s) of the drawing(s), and/or page(s) or paragraph(s) of the best reference(s) cited by the examiner, the applicant, or a foreign office. In rejecting claims for want of novelty or for obviousness, the pertinence of each reference, if not apparent, must be clearly explained and each rejected claim specified. See 37 CFR 1.104(c)(2). For rejections under 35 U.S.C. 103, the way in which a reference is modified or plural references are combined should be set out. The Office action may include objections to the disclosure, an explanation of references cited but not applied, an indication of allowable subject matter, other requirements (including requirements for restriction if applicable), and other pertinent comments. Office Action Summary form PTOL-326, which serves as the first page of the Office action (although a Form PTOL-90 may be used as a coversheet for the correspondence address and the mail date of the Office action), is to be used with all first Office actions and will identify any allowed claims. One of form paragraphs 7.100, 7.101, or 7.102 should conclude all actions. Any inquiry concerning this communication should be directed to  at telephone number . Examiner interviews are available via telephone, in-person, and video conferencing using a USPTO supplied web-based collaboration tool. To schedule an interview, applicant is encouraged to use the USPTO Automated Interview Request (AIR) at http://www.uspto.gov/interviewpractice. 1. This form paragraph, form paragraph 7.101, or form paragraph 7.102 should be used at the conclusion of all actions. 2. In bracket 1, insert the name of the examiner designated to be contacted first regarding inquiries about the Office action. This could be either the non-signatory examiner preparing the action or the signatory examiner. 3. In bracket 2, insert the individual area code and phone number of the examiner to be contacted. Any inquiry concerning this communication or earlier communications from the examiner should be directed to  whose telephone number is . The examiner can normally be reached on  from  to . If attempts to reach the examiner by telephone are unsuccessful, the examiner’s supervisor, , can be reached on . 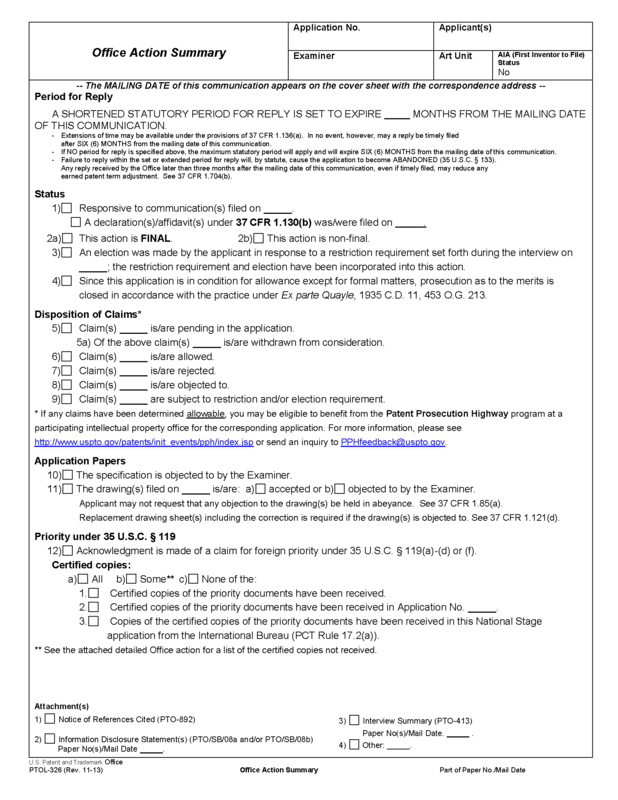 The fax phone number for the organization where this application or proceeding is assigned is 571-273-8300. Information regarding the status of an application may be obtained from the Patent Application Information Retrieval (PAIR) system. Status information for published applications may be obtained from either Private PAIR or Public PAIR. Status information for unpublished applications is available through Private PAIR only. For more information about the PAIR system, see http://portal.uspto.gov/external/portal. Should you have questions about access to the Private PAIR system, contact the Electronic Business Center (EBC) at 866-217-9197 (toll-free). 1. In bracket 1, insert your name. 2. In bracket 2, insert your individual area code and phone number. 3. In bracket 3, insert the days that you work every week, e.g. "Monday-Thursday" for an examiner off every Friday. 4. In brackets 4 and 5, insert your normal duty hours, e.g. "6:30 AM - 5:00 PM." 5. In bracket 6, insert your SPE’s name. 6. In bracket 7, insert your SPE’s area code and phone number. Any inquiry concerning this communication or earlier communications from the examiner should be directed to  whose telephone number is . The examiner can normally be reached on  from  to . The examiner can also be reached on alternate . 3. In bracket 3, insert the days that you work every week, e.g. "Monday-Thursday" for an examiner off on alternate Fridays. 4. In brackets 4 and 5, insert your normal duty hours, e.g. "6:30 AM - 4:00 PM." 5. In bracket 6, insert the day in each pay-period that is your compressed day off, e.g. "Fridays" for an examiner on a 5/4/9 work schedule with the first Friday off. 6. In bracket 7, insert your SPE’s name. 7. In bracket 8, insert your SPE’s area code and phone number. Where the text of sections of Title 35, U.S. Code was previously reproduced in an Office action, form paragraph 7.103 may be used. The text of those sections of Title 35, U.S. Code not included in this action can be found in a prior Office action.